Manchester United manager Jose Mourinho’s interview for the club’s official channels has been branded a ‘disgrace’ by Telegraph journalist Oliver Brown in a scathing attack. 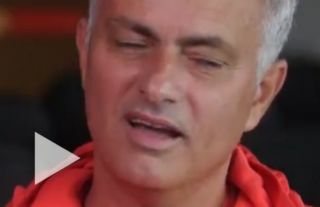 The video below starts with the reporter quizzing Mourinho over the ‘rubbish’ that’s spoken about in the press, inviting the Portuguese to go on a long rant about lies about himself and his players. This comes as Mourinho looks under increasing pressure at Old Trafford, with sources close to Zinedine Zidane telling CaughtOffside that the Frenchman expects he could get the job imminently after the Red Devils’ poor start to the season. See the clip below, with Brown tweeting that the reporter in the video is little more than an ‘in-house cheerleader’. He goes on to blame Mourinho for his grumpy demeanour at press conferences – hardly something the media can be blamed for as they put the manager through what every other boss in the Premier League also has to adhere to. Especially when the 'rubbish' about Mourinho's toxic reign at Man Utd is anything but. As he shows at 'relaxed' Carrington by skulking out of his subsequent press conference there after eight minutes.